Spindle trees (Euonymus spp.) are tough and adaptable plants that, even though they are referred to as trees, often grow with a dense shrubby habit. 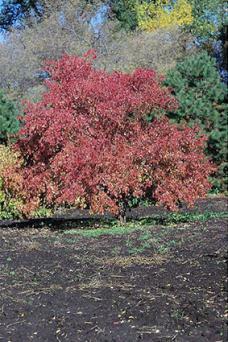 Aesthetically, they are known for their fall display of colorful foliage and unusual berries. Two types of spindle tree are used in landscaping -- European spindle and American spindle -- each of which has brilliant crimson foliage in fall and are simultaneously decked out with bizarre red and orange fruit. 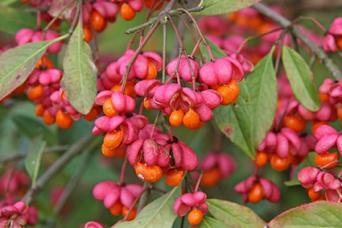 The fruit, which hangs onto the branches as the foliage drops, opens into fours sections, earning spindle trees the alternative names 'hearts-a-bustin' and 'strawberry bush'. 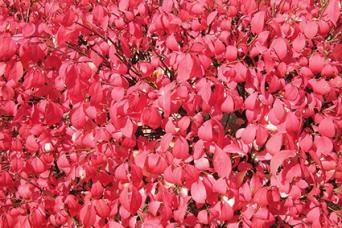 The fall foliage is responsible for another of its alternative names: 'burning bush'. The white flowers in spring are small and insignificant as is the foliage before it turns its fiery color - spindle leaves are a nondescript oval shape and about two to three inches long. European spindle can eventually grow 20 feet wide tall and wide, though it is often seen smaller, while the American variety usually remains under 10 feet in height. The plants are mildly toxic though large quantities must be consumed to cause a serious health threat. Spindles are worthy of being a focal point amid a bed of perennials, where they look best with the lower branches pruned off to encourage a more tree-like shape. However, spindles are most commonly used as hedges, where they look best if left unsheared and allowed to adopt their natural rounded shape. They have great wildlife value because of their dense growth habit and berries. Spindles are known for being tough -- they withstand drought, intense heat, and poor soil with relative ease. They will tolerate partial shade, but there are far more berries in full sun. Typically, potted spindle trees are purchased from a nursery . Spring or fall is the best time to plant. They need a hole as deep as the root ball and slightly wider, but no other special treatment. Planting in wet, soggy areas should be avoided, however. Care is minimal once they are established. They may be pruned as desired to control their size and shape, but otherwise tend to grow beautifully if left to their own devices. Various pests and diseases attack spindle trees, but the only one of serious concern is called spindle scale. This is a tiny whitish pest that colonizes the undersides of leaves. Mild infestations may be treated using insecticidal soap, but severe cases will likely require an insecticide to prevent the plant from being destroyed. American spindle (E. americanus) is hardy in USDA zones 5 to 9 and is commonly available in nurseries throughout the country. As a native plant, it is generally found in its basic wild form rather than as an improved cultivar. European spindle (E. europaeus) is hardy in USDA zones 4 to 7 and is commonly available in nurseries throughout the country. 'Red Cascade' is the primary cultivar found in nurseries and is known for its deeply saturated red color and prolific berry display. 'Albus' has white fruit instead of red. For much of the year, spindles trees are not the sort of plant that call attention to itself. As the weather cools off in fall, however, be prepared for one of the brightest displays of red foliage in the plant kingdom.